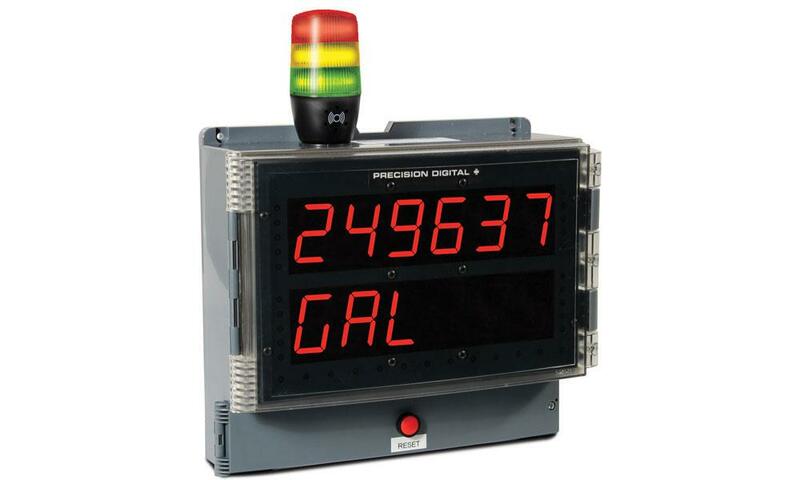 Helios Meter Shown with MOD-PD2LHRB1 Red Light / Horn and Reset Button. Meter Sold Separately. The MOD-PD2LH can be powered from the Helios’s 200 mA transmitter power supply with enough power left over to drive most transmitters. 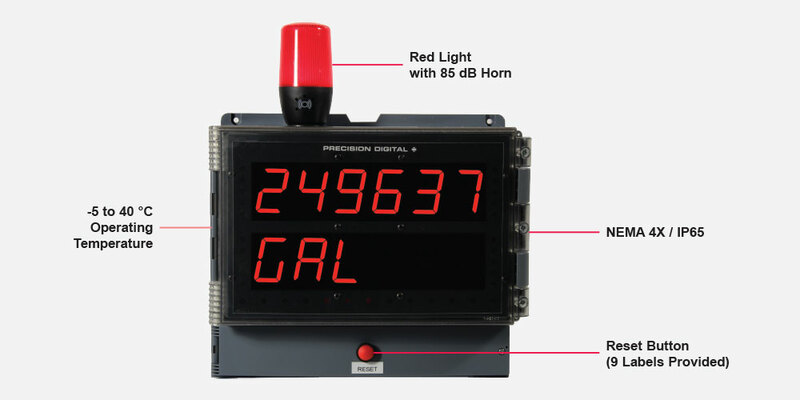 The light(s) and horn can be controlled independently of each other via separate relays on the Helios. These relays can be programmed for automatic or manual reset action to satisfy a wide variety of audible and visual alarm applications. The light can be programmed to flash (not available on MOD-PD2LH5CB1) or stay steady-on. The Light / Horn and Reset Button do not affect the Helios’s NEMA 4X rating, but do void its UL approval. 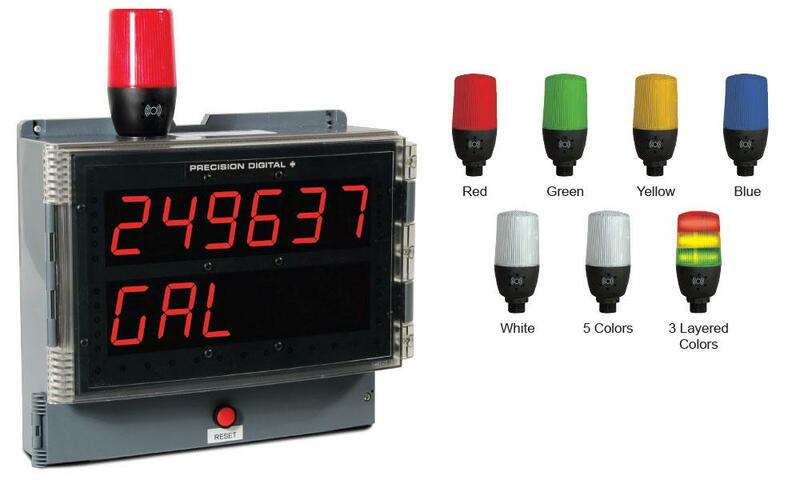 There are a wide variety of ways these Light / Horn devices can be controlled by the Helios's four relays to satisfy visual and audible alarm applications. Please feel free to contact tech support to discuss your particular application. The following examples illustrate some typical applications. Note: Unless otherwise specified, this MOD is shipped wired in the above fashion. Connections shown for a red light model. 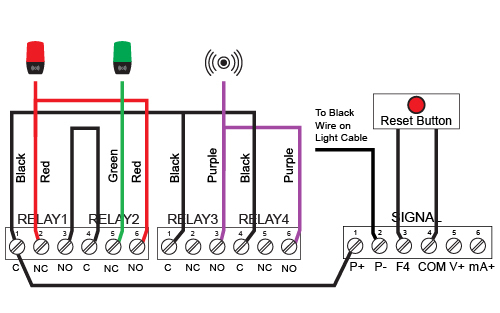 For other MOD-PD2LH models, the red wire is the color of the light. 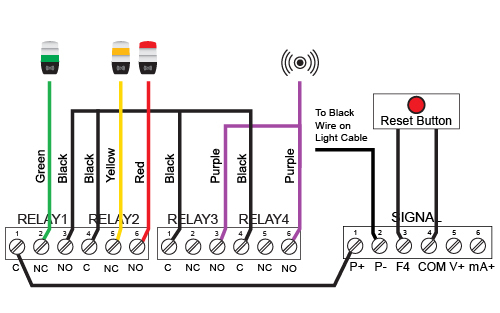 Connect the red and black wires for a Steady On light and red and gray wires for Flashing light. 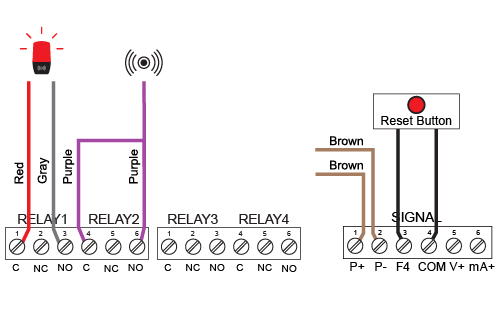 The Helios can be wired to power both the Light / Horn accessory as well as the transmitter input and isolated 4-20 mA output as the following diagram illustrates. Transmitters and sensors that require more than 163 mA must be powered by an external power source, such as the PDA1024 as the following diagram illustrates. Recommended for these Helios Models: PD2-6000, PD2-6001, PD2-6100, PD2-6200, PD2-6300, PD2-6400, PD2-7000. When ordered on other Helios Models user may need to re-wire Light and Horn accessory. MOD-PD2LH3LCB1-RYG: 1 layer each of red, yellow, green (consult factory for other colors available). Transmitter Power Supply: The Helios's internal transmitter power supply is downgraded from 200 mA when it powers the Light / Horn. To determine the total downgrade, add the currents for the light(s) being used and the horn if used. If more power is needed, then consider the PDA1024-01. Approvals: Installation of the Light / Horn accessory voids the Helios’s UL approval. Helios’s NEMA 4X rating is not affected.